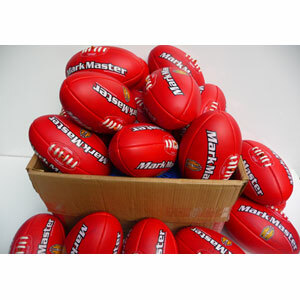 Size 5 Australian Rules Skills Training Football by Mark Master footballs. Practice everything you do when playing a real game of footy. Kick, Mark, Bounce the Ball and Handball. Simply attach the ball to your wrist… its that Easy. The Mark Master Training Ball is also perfect for those who have to limited space to play in. The comfortable wristband is attached to the wrist. 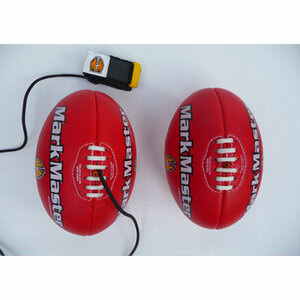 The Training Ball will only travel up to 4 m. Anyone can use the Mark Master in a small backyard safely without the football disappearing over the neighbor’s fence, on the road, or on the roof. 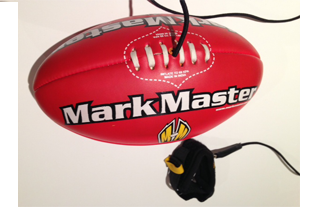 The Mark Master Training Ball, allows a player to practice ALL the skills required to play Aussie Rules Football. 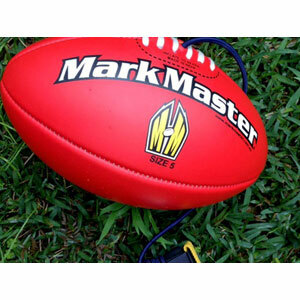 If a player is beginning to play AFL football for the first time, then a Mark Master Training Ball is a must have. The player attaches the wrist band to the wrist, the Mark Master Training Ball allows the user to play alone. There is no need to drag brothers, sisters, parents or friends to the park to have a kick of the footy, instead they can spend hour after hour, day after day honing their skills. If your recovering from an injury, seriously think about Training Ball. 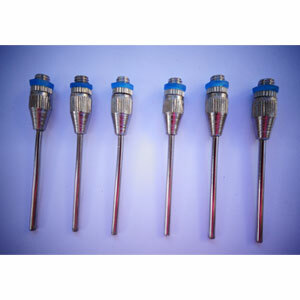 It will HELP you with your recovery. Players should be able to slowly increase their AFL football skills to the level where they are able to bounce, kick, mark and handball while walking. When a player has mastered these skills while walking, try doing the following skills while running. Bouncing the ball, kicking the ball and then marking the ball on the run. 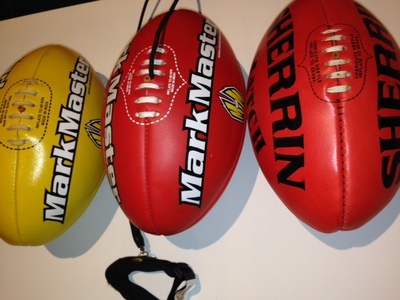 When players have reached this skill level, then Mark Master AFL Training Ball has done it’s job…. 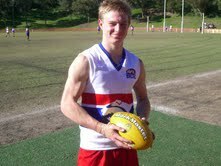 International AFL Football Club are Welcome. Please feel free to either call or email me if wish to place an order or have a question. The Ultimate, Aussie Rules Training Football. 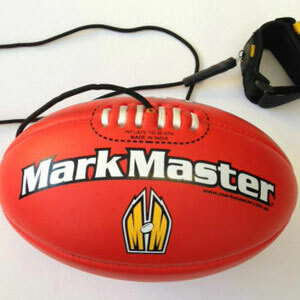 If your a NEW player to Aussie Rules Footy, this Training Football is a Must Have!!! If your recovering from injury the Training Ball will definitely HELP You. 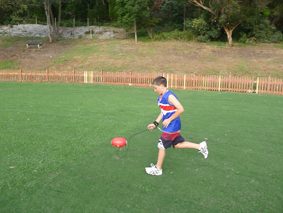 This is a Training Ball that can used at Home, In the Park or at Training. We often wonder what our customers call our training balls. 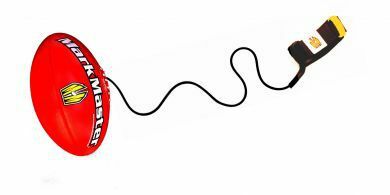 You will hear them called: Ball on a string, come back ball, Mark Master AFL ball, Bungee Ball, football skills ball, football drills ball and ball on a rope, football on a string, football on a rope.